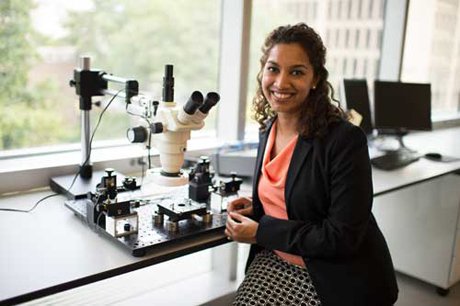 Saniya LeBlanc, an assistant professor in GW's School of Engineering and Applied Science (SEAS), has recently been awarded a Commonwealth Research Commercialization Fund (CRCF) grant by Gov. Terry McAuliffe to continue her work developing technologies that address the growing demand for energy and improving their energy efficiency. Her $99,342 grant for "Next Generation Power Generators with Selective Laser Melting of Thermoelectric Materials" is one of 48 awards totaling $3.4 million, which fund targeted areas of promising research and commercialization in Virginia. LeBlanc’s one-year research grant, which began July 1, 2016, will be used to develop a waste-heat-to-power thermoelectric generator using a selective laser melting additive manufacturing approach at GW’s Virginia Science & Technology Campus. Thermoelectric generators are devices that directly convert heat into electricity and offer the potential for effective waste-heat recovery in combustion and process heat applications like in engines and furnaces. However, the traditional, multi-step thermoelectric generator manufacturing process is wasteful, costly, and limits the amount of power generated. The project will use selective laser melting to produce new, 3D structures and eliminate traditional manufacturing steps. The project objectives are (1) to demonstrate and characterize laser melting of thermoelectric materials and (2) develop a prototype thermoelectric generator using selective laser melting. The first objective will generate valuable intellectual property by advancing the additive manufacturing frontier. The second objective could both reduce costs through improved manufacturing and increase power generation through optimized performance, thus providing a viable waste-heat recovery technology capable of achieving market penetration. The project is led by Dr. LeBlanc, who has industry, academic research and development expertise in thermoelectric materials, energy systems design, scalable manufacturing, and cost-performance analyses. The team also includes Dr. Ahmed El Desouky, a postdoctoral scientist with experience in materials processing, powder metallurgy, and novel manufacturing techniques. Prof. LeBlanc and her colleague have significant work ahead developing and testing their promising technology. The project timeframe for commercialization is three years.